If it wasn’t bad enough that our pets have to deal with the internal parasites – they also have to deal with the external ones. External meaning parasites that are found on the outside of the body. Fleas – those annoying little black bugs that you’ll see jumping and scurrying through your pets coat. Fleas can be picked up ANYWHERE. In fact, you don’t even need to own an animal to bring fleas into your home. Many pet owners think that since their pet never leaves the home/yard that they will not pick up fleas. THINK AGAIN! Fleas will use any mode of transportation necessary. This means that if you happen to be visiting a friend’s home who has a flea problem those fleas will hitch a ride on your clothes right back to your own home and set up residence. Fleas populate at an alarming rate. 1 adult female flea can lay upwards of 50-100 days PER DAY. If you have 10 female fleas that could easily lead to 1000 eggs/day. You can now see how easily an infestation happens! Fleas are also incredibly resilient. They flourish in perfect conditions… hibernate in not so perfect conditions waiting for the perfect time to *wake up*. Fleas are a major annoyance to your pets. Many pets are sensitive/allergic to flea bites. One bite can send your pet into a scratching frenzy. The constant scratching puts your pet as risk for breaking the skin which opens him up to bacterial infections which will require antibiotics to treat. Fleas can carry tapeworms (as mentioned previously). Fleas can cause anemia in the young or debilitated pet due to extreme blood loss. Fleas will & do bite humans although they do prefer animals. There are many great products on the market (oral/topicals) to help kill fleas thus preventing infestations. Talk to your Veterinarian. Many of the over-the-counter products sold in department stores are toxic (especially to cats) Veterinary products are drug regulated, extremely safe and very reliable. Fleas, unfortunately, are here to stay. PREVENTION is way easier and cheaper than TREATMENT. Ticks – ticks are part of the arachnid family. They are found in dense, heavily wooded/grassy areas. These nasty critters will jump onto your pet (AND YOU! ), crawl around for perhaps a day or two to find the perfect spot, then latch on to feed. They are incredibly small and often go unnoticed until AFTER they’ve been feeding for a while (at which point they grow and become more noticeable) After feeding is complete the tick drops off. It’s rare to see a tick infestation on a cat due to the fact that cats are fastidious groomers. You are more likely to see multiple ticks on a dog. The onus is up to the pet owner to check their pet regularly for ticks and remove them. Removal is very easy and painless to your pet. 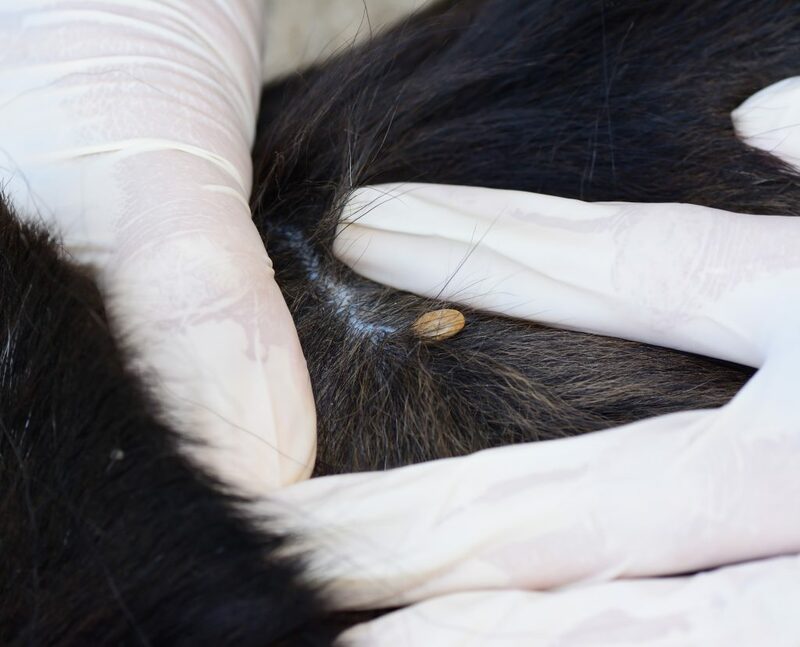 Since some species of ticks carry Lyme disease it is advised to take the tick to your Veterinary office to have it tested to see if it’s a carrier. There are many products on the market to help keep your pet tick-free. For high risk pets (country dwellers or avid outdoorsy types) there is also the Lyme vaccine to consider. Talk to your Veterinary staff. Ear Mites – I, personally, could not imagine having bugs crawling around in my ears… ACKKKK!! Ear mites cause intense itching for your pet. Aural hematoma is basically a large blood blister that can form on the ear. It is caused by rupture of small blood vessels that occurs because the pet is continuously scratching the ears or shaking the head. Hematomas require medical care. Ear mites simply need to be dealt with. A simple ear exam and/or ear swab by the Veterinarian can diagnose ear mites. Prevention is available. Treatment is relatively easy (medicated drops in the ear) If 1 pet has ear mites ALL pets need to be treated. Ear mites are generally not a problem for humans. Mange (Demodectic) – Demodex is the most common type of mange. This mite lives in the hair follicle. All normal healthy dogs and many humans have a few of these mites on their skin and as long as the immune system is in good working order they cause no harm. Young dogs (less than 12-18 months of age) with immature immune systems and older dogs (with tiring immune systems) tend to be the targets. This isn’t an overly *itchy* kind of pest. It’s more of a *cosmetic* issue – intense patchy, hair loss. Secondary infections CAN sometimes occur which requires antibiotics. 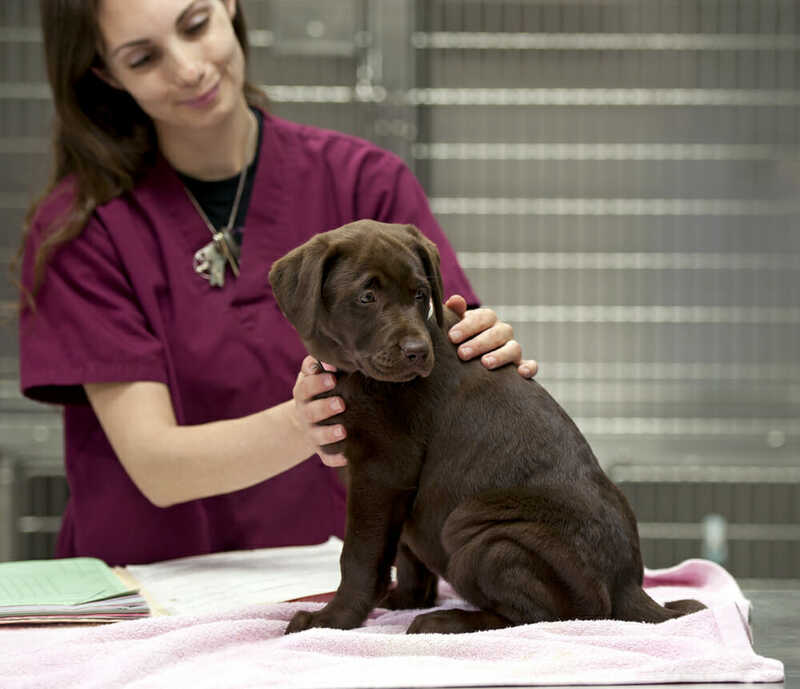 Diagnosis is determined with skin scraping/analysis in the Veterinary office. Treatment is similar to Sarcoptic mange with dips/shampoos and oral medications. Because this is attributed to the immune system (whether immature or tired) the likelihood of relapsing into another infection is greater. Once the dog matures out of puppyhood it’s less likely to re-occur. Demodex is not contagious to other dogs or humans. So there you have it folks… the most common parasites your pet will acquire. Some regions are higher risk than others due to environmental conditions so you should be familiar with all. Knowing your pets’ risks, prevention and treatments are the key to successfully managing parasites.